Specialty stain removal techniques like removing coffee stains require proper education of chemistry and carpet fiber identification and construction. Now, I know that sounds like the nerdiest thing you’ve heard all week, but bear with me. I’ll explain why you can completely trust The Carpet Chemist with removing coffee stains that your last carpet cleaning company couldn’t remove. OK if you’re not old enough to understand those lyrics, you’re not old enough to drink coffee anyway. So let’s jump into why it’s so important to understand chemistry and carpet fiber identification and construction when removing coffee stains. Carpet Fiber Identification. This is the most important part of removing coffee stains. All carpets and rugs are not created equal. Wool rugs and carpet must be treated much more delicately than a synthetic fiber such as nylon or polypropylene. Sugars and Dyes. 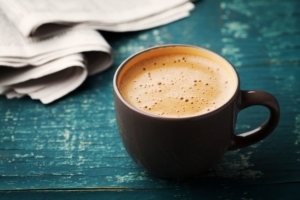 Sugars in coffee have chemical reactions with certain cleaning products, and unless you’re a professional carpet cleaner you may end up doing more harm than good. Dyes in flavored syrups can create difficult stains, and protein in milk or creamer needs to be treated with a protein remover. Color Loss. Oxidizers are generally great for removing coffee stains, but the trick is knowing what ratio is just the right amount. Too little will do nothing and too much will absolutely remove color from your carpet or rug. Rinse. The second most important thing you’ll need to know is that no matter how much of what chemical you dump on your carpet when removing coffee stains, you must extract with an all fiber rinse. Unless of course you’re using a slow activating oxidizer as mentioned previously. The Carpet Chemist says: “Put that coffee down! Coffee’s for closers only.” OK if you don’t get that movie quote, click on our Juice Spills page. To schedule an on-site estimate, speak to our reputable experts or inquire about Carpet Chemist’s Odor Removal service, call 800-515-1342. For your convenience, you can also request a carpet consultation online. Your email is safe with us. We respect your privacy and will never sell or share your information with third parties!